Enrich your trip to Florence with a voyage into the heart of Tuscany, with a visit to two of the most beautiful, characteristic towns - Siena and San Gimignano. A car and expert driver will be waiting for you at your hotel in Florence to take you to San Gimignano where you will meet our guide and begin the visit to San Gimignano and Siena. This wonderful tour will give you a fascinating to window into Tuscany. An amazing experience where you will see that even though though these two enchanting cities are very close to Florence, their culture, traditions and foods are very different indeed. A fascinating opportunity with us to taste typical foods of the area and seeing the great sites like the towers of San Gimignano to the famous Piazza del Campo in Siena and see the great Cathedral of Sienna which is without a doubt, one of the most beautiful churches in Italy filled with beautiful works of art including beautiful frescoes by Pinturicchio. Once finishing the church you can enjoy an incredible panoramic view of the Tuscan countryside which is the perfect ending for such a splendid day. A car and driver will be waiting for you at your hotel in Florence to take you to San Gimignano where you will meet our guide and begin the visit to San Gimignano and Siena. At the end of the tour you will be taken back to your hotel. Visitors flock to Florence, but you don’t truly know Tuscany until you’ve explored beyond. Enrich your trip to Florence with a voyage into the heart of Tuscany, with a visit to two of the most beautiful, characteristic towns - Siena and San Gimignano. Both towns are located in some of the most spectacular Tuscan countryside, with green valleys and rows of cypresses. On your day trip from Florence you’ll go on a journey into this enchanted landscape to discover the breathtaking beauty of Siena - graceful medieval city that has retained its historic character - and the tranquil hilltop town of San Gimignano. Accompanied by your private guide, you’ll discover the fascinating history of the towns and the important role they played in the Middle Ages, during a busy period of commercial activity and long-distance pilgrimages. Although the beauty of Siena and San Gimignano is obvious to every visitor, it takes a more in-depth visit to truly appreciate the unique character of these places. Join our Florence day trip to Tuscany for a true discovery. San Gimignano is a small town, and on your Tuscany private tour you’ll have plenty of time to see its main sites as well as some of its secrets, hidden in the charming alleyways that wind up the hillside. You’ll explore the streets and piazzas of San Gimignano, passing by art studios, wine bars and traditional shops and restaurants. Piazza del Duomo, the centre of political and religious life in the medieval town, is one of the highlights of the visit. Entering the church of the Collegiata, you’ll be struck by the vivid 12th century frescoes, including The Last Judgement by Taddeo di Bartolo - a terrifying vision of eternal torment in hell. The church also contains work by other Tuscan artists, such as The Creation of the World by Bartolo di Fredi, and the Life of Santa Fina by Ghirlandaio, one of the greatest artists of the Renaissance. The nearby Piazza della Cisterna - named after the old well in the centre of the square - has an unusual triangular form and is surrounded by some of the oldest, most beautiful buildings in the city, retaining its medieval character. 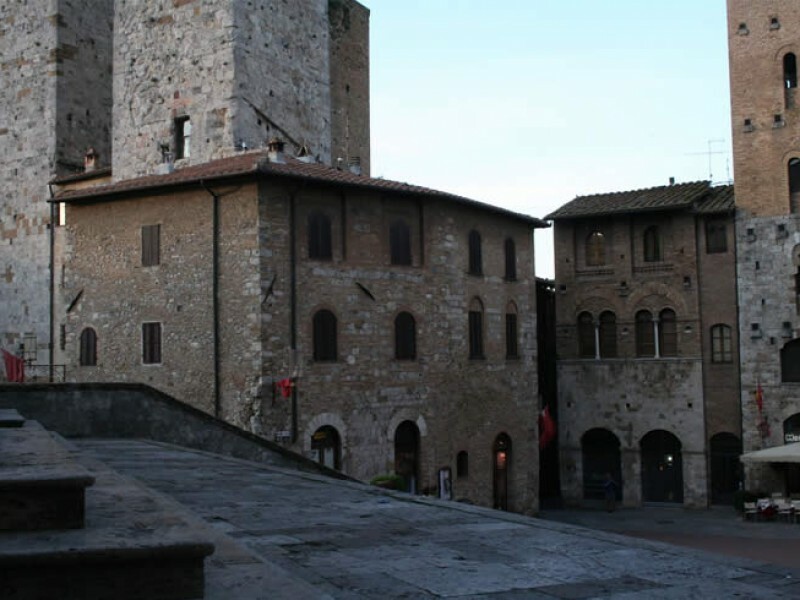 A stroll through the centre of the town takes us to the ancient Rocca, the fortress of San Gimignano. This tower offers incredible views of the town and beyond, to the green hills of the Tuscan countryside. It’s a memorable end to your tour of San Gimignano, giving you a new perspective on the beauty and history of this enchanted hilltop town. A private tour of Siena is the perfect way to uncover the city’s secrets, exploring the churches, piazzas and alleyways of this spectacular medieval city. From the grandeur of its main square to the subtle charm of its backstreets, Siena never ceases to enchant its visitors. Your personal guide will take you on a journey through Siena’s history, discovering artistic masterpieces and stunning panoramas along the way. The most famous of Siena’s squares is the extraordinary Piazza del Campo. Located in the very heart of the city centre, this shell-shaped square is encircled by elegant palazzi, and is widely regarded as one of the greatest medieval squares in Europe. It has been the centre of Siena’s public life for centuries, and it once played an important political role, as the location of the grand Palazzo Pubblico and the Torre del Mangia. On your Siena tour you’ll stroll through the piazza, admiring its architecture while learning about the politics and commerce of the medieval city. From Piazza del Campo it’s a short walk to the second most famous square in Siena, the Piazza del Duomo. The square is dominated by the imposing 13th century cathedral, which has a striking facade of black and white marble. 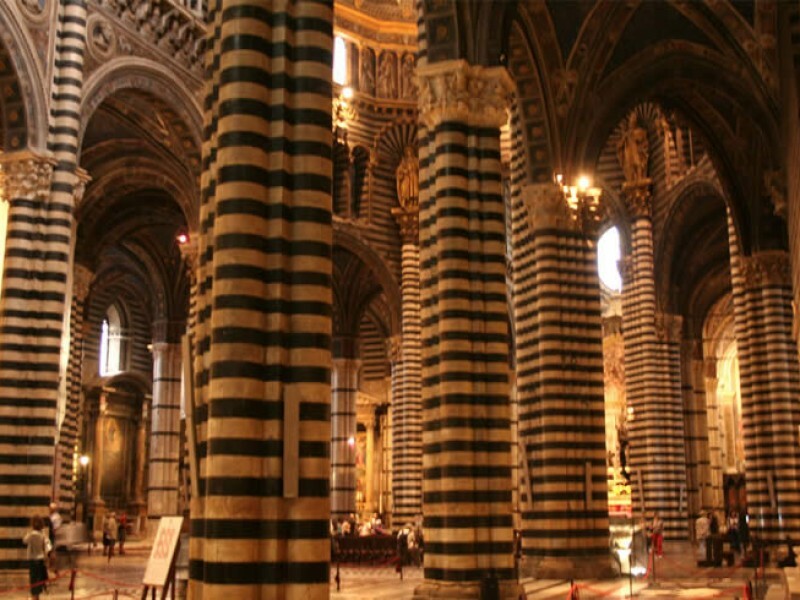 Black and white are the traditional colours of Siena, and the origin of this tradition has an intriguing connection with the myths and legends of the city’s foundation, as you’ll discover on your tour. As well as learning about the rich history of Siena, you’ll also have the opportunity to study its architecture and admire the beauty of its artistic treasures. On your visit to the Duomo you’ll discover that seemingly every inch of the cathedral is filled with masterpieces, from the bronze sculpture of St John the Baptist by Donatello to a statue by the young Michelangelo. There are also works by Bernini, and various masterpieces of medieval and Renaissance art. The vibrant frescoes of the Piccolomini Library are particularly impressive, and on your Siena private tour you’ll learn about these beautiful artworks in their historical context, enriching your appreciation. Your day trip in Tuscany will end with a short walk to the Basilica of San Domenico, which watches over the town from the top of the hill. This enormous church was built in the 13th century and subsequently enlarged, incorporating many features of Gothic architecture. After exploring the vast, atmospheric interior of the church and seeing the relics of St Catherine, you’ll step outside to enjoy panoramic views of the countryside - the perfect end to your Tuscan journey. The skyline of San Gimignano is instantly recognisable, characterised by rows of magnificent medieval towers. During the 13th century rich lords moved to the town from the countryside and constructed these imposing towers throughout San Gimignano, as a symbol of their power and wealth. 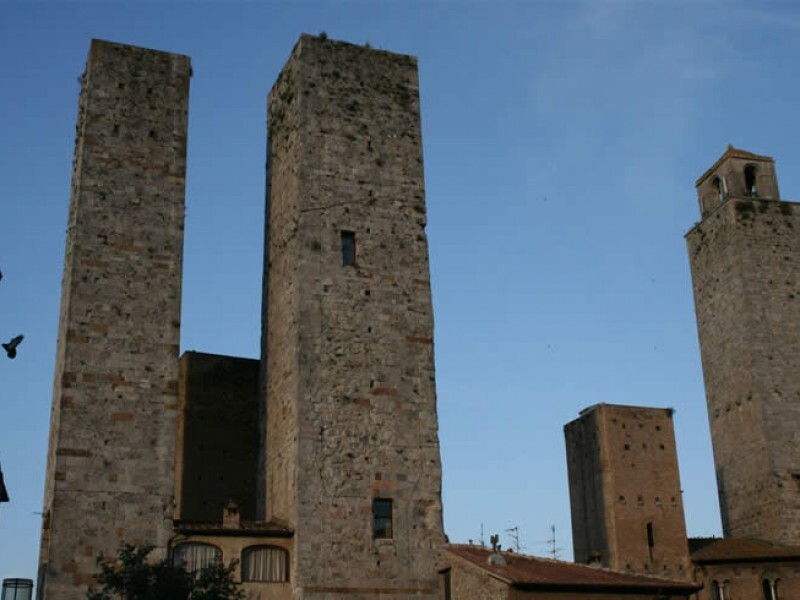 These towers were their private residences, casting a shadow over the less well-to-do citizens of San Gimignano. Only 13 of the 72 original towers are still standing, but these evocative monuments offer a key to understanding the social hierarchies of medieval society. San Gimignano was an anonymous little town until the 11th century, when its location on the Via Francigena began to attract new kinds of visitors. The Via Francigena is a route of pilgrimage from Canterbury to Rome, still in use today. The road was used not only by pilgrims on their way to Rome, but also by an increasing number of merchants, and other long-distance travellers, who stopped off at San Gimignano to do business. The town began to flourish as a centre of saffron and mulberry cultivation, while the production and exportation of Vernaccia, the local white wine, helped the town to grow in size and wealth. In San Gimignano you’ll learn more about this period of prosperity, and about the daily lives of the town’s inhabitants, as well as the decline in the 15th century. The remaining towers are a poignant symbol of a golden age that could not last forever. Siena was also very prosperous in the Middle Ages, in part due to its location on the Via Francigena. It became a centre of money-lending, and also played an important part in the wool trade. Commerce and culture thrived, and Siena became an independent city-state, ruled by a government that was backed by the most prominent noble families in the city. 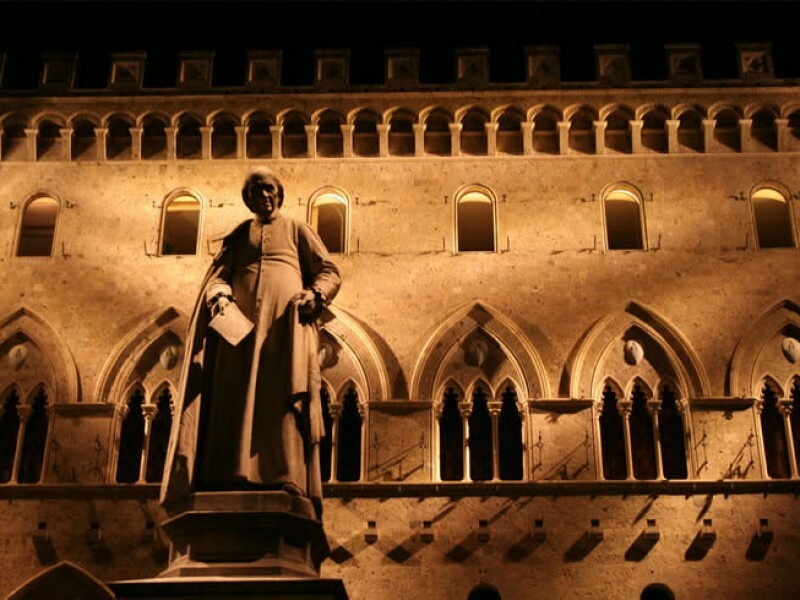 One of the oldest universities in Italy was founded in Siena in 1240, and the city has long been associated with education. The golden age of Siena began in the early 14th century. With a population of 50,000, booming businesses and some of the most talented artists and architects of the age leaving their mark on the city, Siena had good reason to be optimistic. However, the terrible plague of 1348 devastated the city, and Siena then went into a decline that lasted for centuries. It was only the 17th century introduction of the Palio that led to a transformation of Siena’s reputation and atmosphere. The Medici family introduced the Palio - a horse race in the central piazza - as a celebration of Siena’s medieval traditions. From this point onwards, with the revival of old festivals and traditions, Siena began to take pride in its history and unique character. Ever since, it has been recognised as one of the most beautiful, culturally significant cities in Italy.